Emily Garcia's specialty is making disk beads in a variety of sizes and stringing them in multi-strand necklaces. She always strings her necklaces on traditional beading string and this gives her necklaces nice, fluid movement and sway. 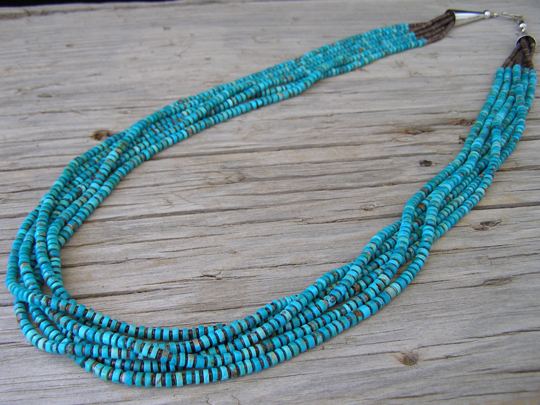 This full-length, six strand necklace combines uniform-diameter beads of Kingman turquoise with spacer beads of baby olive shell fine-diameter heishi. Stringing the baby olive shell heishi between the Kingman turquoise beads creates strands which are incredibly silky in their movement. There is nothing stiff about a necklace like this and you'll love the way it moves and the way it feels when worn. Finished with Sterling cones and strung, of course, on traditional beading string.